Winter photo session in the west part of Iceland by Hraunfossar waterfall. 2 day photo road trip to the Glacier lagoon in Iceland and stopping at many great locations gave us a collection of amazing photographs. Flying to the Glacier lagoon and renting a car gave us the most productive day and best results possible. Photo shoot by the Glacier lagoon in southeast of Iceland. We also stopped by a lavafield with green moss on the way back to Reykjavik. 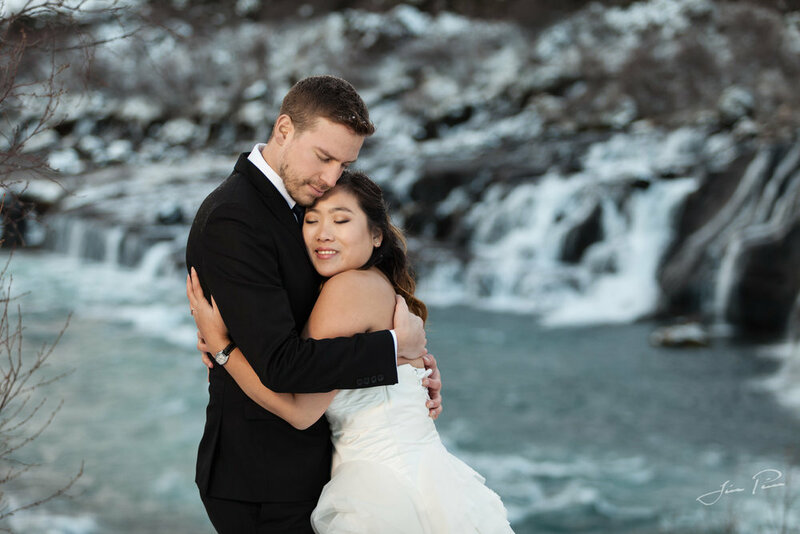 Wedding photography in natural settings by Þingvellir national park in Iceland. Backstage from a photo session in the Crystal ice cave in Iceland. Backstage video of a pre-wedding photo session with Jon Pall, wedding photographer. Kusse Soka and Selamawit from Ethiopia were photographed at the glacier lagoon in Iceland. Videography, editing and photography assistance by Zsuzsa Darab. Backstage video from a pre-wedding photo session with Stephanie Tang is from Belgium and Pierre-Charles from France. We took them to Hraunfossar (Lava falls) in the west part of Iceland and then to a large lava cave, Víðgelmir. but we do take credit for happy customers. "Thanks once again for the amazing photos, you would be pleased to know how impressed our friends and families were when we showed them the pictures! " "We got the dropbox pictures. They are beautiful!!! Thank you so much for your work!!" "We have received the photo album, it is really great and we are enjoying going through the album, these are great memories for us. We have talked to both our families and arranged to have our wedding next year in New Zealand."